1967 Lincoln HS State Champions Edward Wilson and Jerry Hilliard to be Recognized at Game Friday! During halftime of the Wolves game against the Shelbyville Dragons on Friday, February 8th, two former San Augustine ISD athletes were recognized. Dr. Virginia Liepman recognized Mr. Edward Wilson and Mr. Jerry Hilliard (represented by Rev. Jackie Renfro) by presenting them with a plaque and sharing their accomplishments with the crowd. 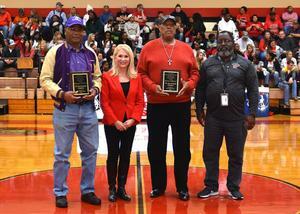 On Saturday, July 21, 2018, these two former SAISD athletics were inducted into the Prairie View Interscholastic Coaches Association “Hall of Fame” in San Antonio, Texas some 50 years after they helped propel the Lincoln HS Tigers Basketball team to a 35 and 3 season and then on to win the 1967 State Championship Title defeating Mexia by a score of 87 to 77. 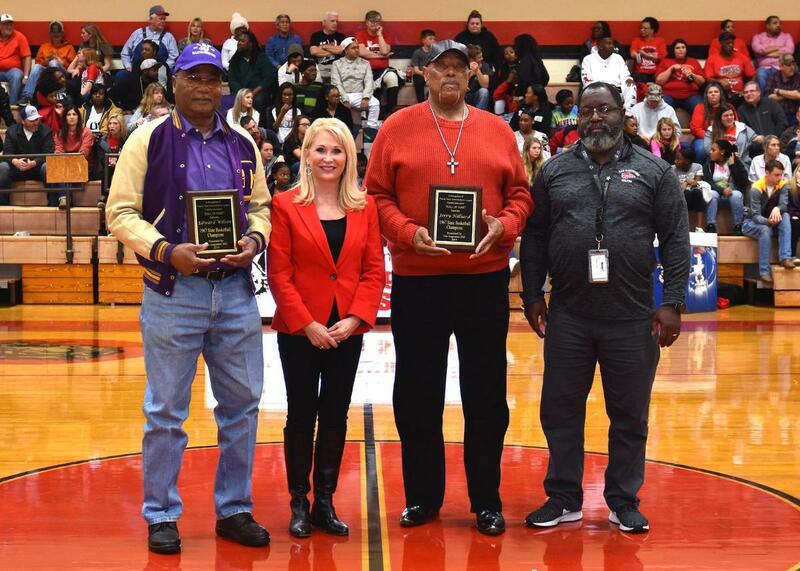 Edward Wilson and Jerry Hilliard were senior members of the 1967 Lincoln HS state championship basketball team, but both men have a long list of additional accolades during their HS years that have created a life time of memories for them and their families. Because of their outstanding athletic abilities, they now join other outstanding athletics in this prestigious Hall of Fame. San Augustine ISD would like to congratulate these fine men for their contribution to the sport of basketball and for their continued support of their communities. This is a truly remarkable achievement, and we are so very proud as a school district and as a community.